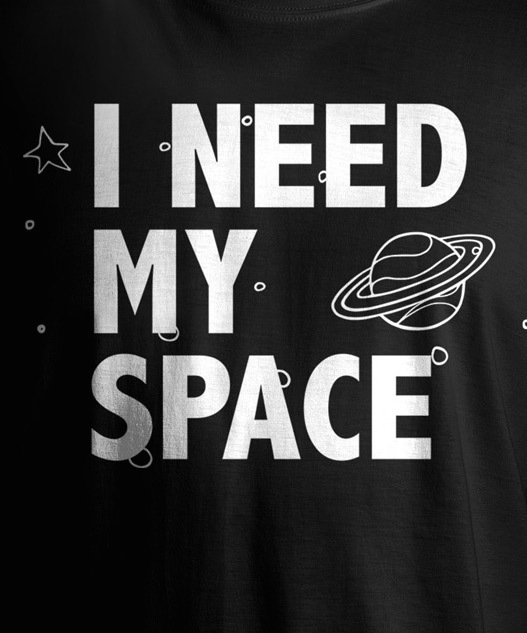 Astronomy Day is celebrated twice a year, spring and fall. 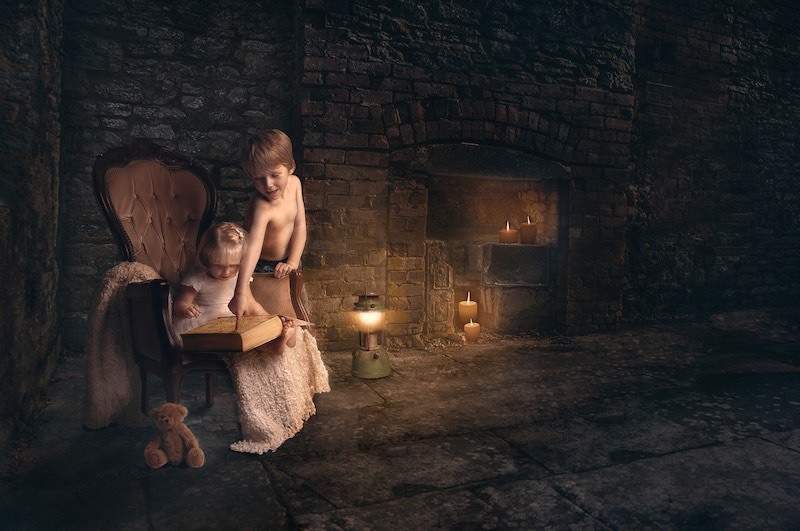 The spring holiday occurs between April and May each year. This year it will take place on May 14th. Be sure to get your celebratory garb such as the T-Shirt above! Player A and B are involved in a rally against opponents C and D and the ball is coming their way. Player B notices that the ball is going to be short and he starts to run toward the net. He gets to the ball about halfway between the baseline and the NVZ and moving forward is able to drop the ball over the net. The ball lands on the other side where neither player (C or D) can return it before it bounces twice. After the second bounce, however, player B’s momentum carries him into the net where he touches it. Is this a fault on the part of player B? 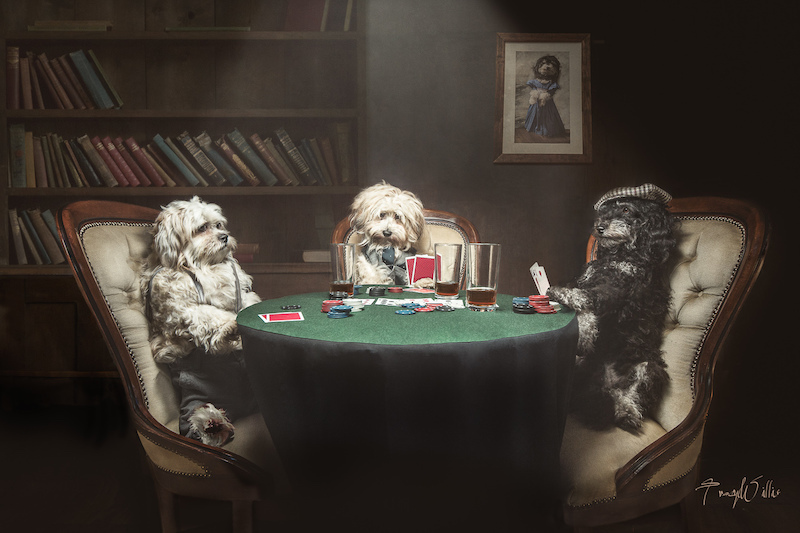 The operative words in the scenario described above are “before it bounces twice.” Which, according to rule 7.E., the ball was then dead and not in play so this would NOT BE A FAULT. NOTE: This is NOT THE SAME as the NVZ where momentum cannot bring a player into the NVZ even after the ball has bounced twice, i.e. dead. Check out Additional Pickleball Info and Videos! After a bit more than three days in Tokyo, we boarded a cruise ship to head to other interesting Japanese ports. 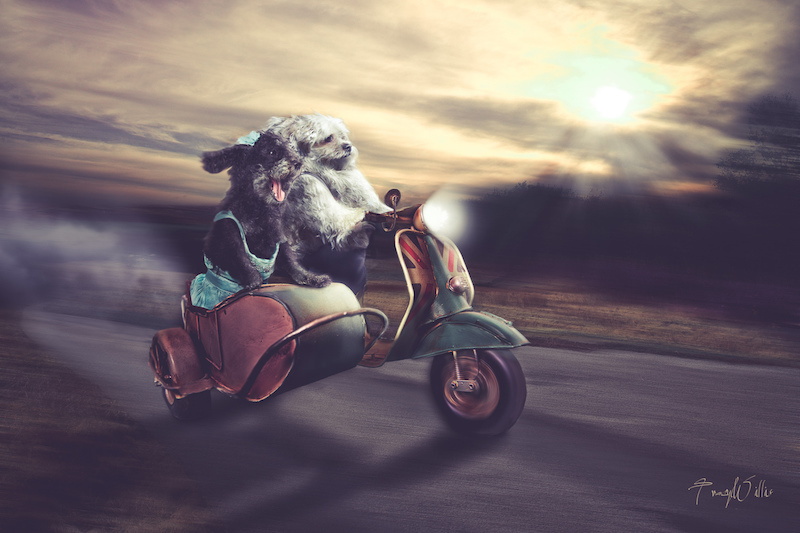 Whoever coined the phrase,“Getting there is half the fun”, must have had cruising in mind. We certainly enjoy the restful days and evenings at sea while reliving the novelties of the day and anticipating those to be next. Here is a panorama from the deck of our ship soon after boarding. It was a very nice, sunny day at the pier. 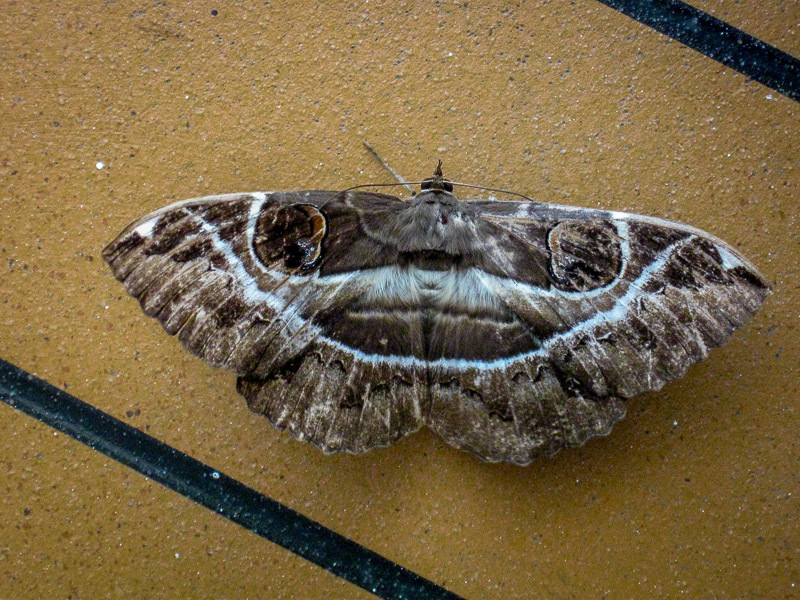 As we strolled the deck to review the location of important ship venues, we found this beleaguered Noctuid moth (perhaps a positive omen of some sort!). 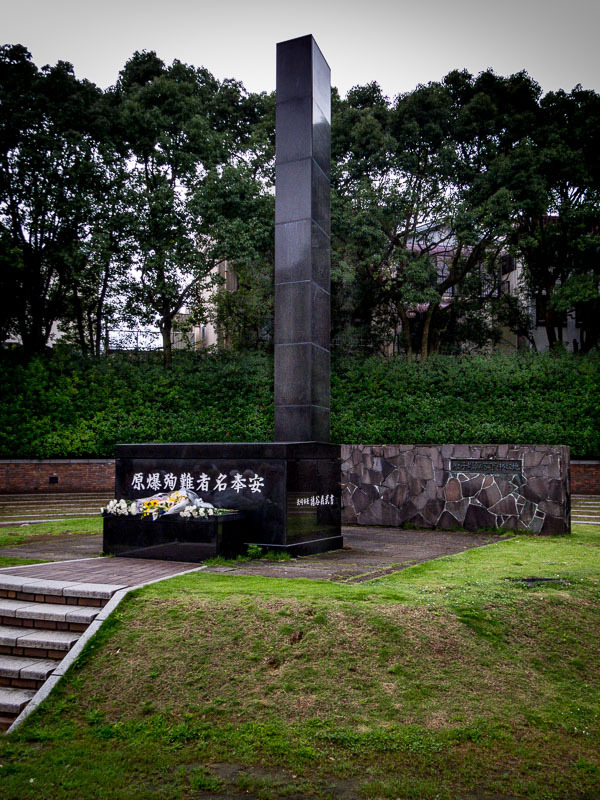 The first port of call was Nagasaki and the day was appropriately bleak for visiting this somber, historic site. The grayness and drizzle lent to the solemnity of the occasion. 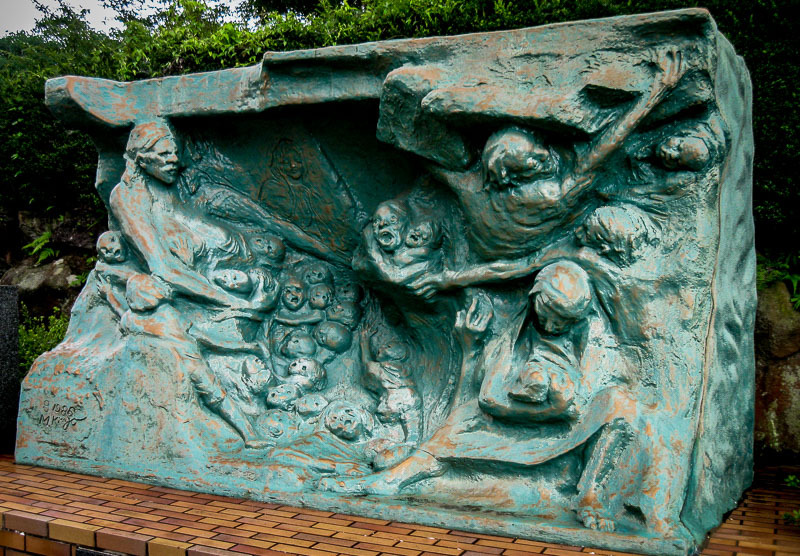 For those too young to know or remember, Nagasaki was the site of the second atomic bomb detonation by the US during WWII. 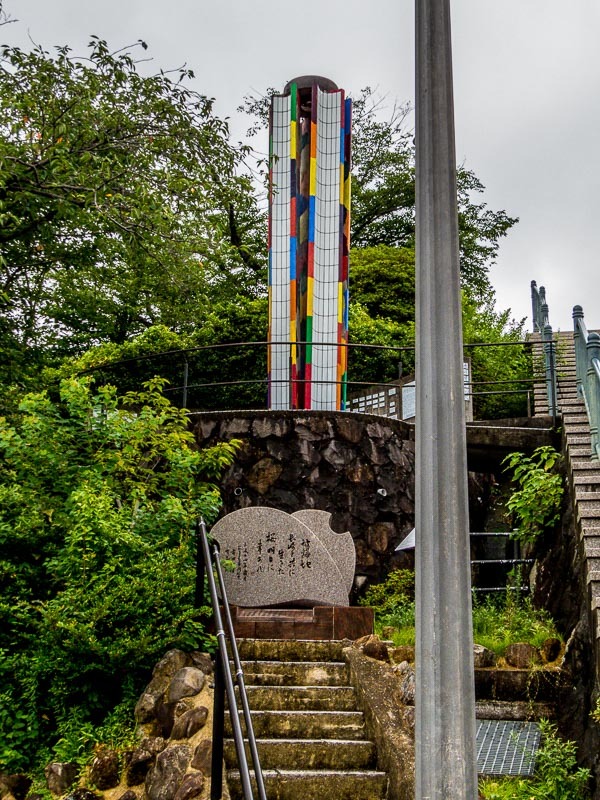 We were brought to the Nagasaki Peace Park and one of the very first things that grabbed my attention was this large statue known as The Prayer Monument for Peace created by Nishimo Kitamura. 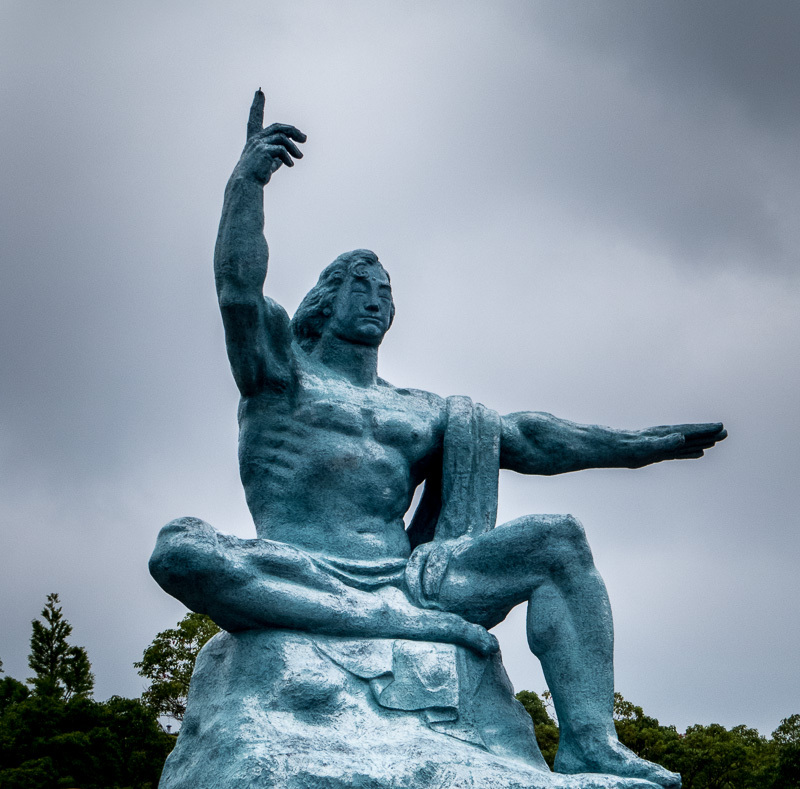 The right arm (pointing to the) sky means the threat of (an) A-bomb. The left arm stretching horizontally means the peace. 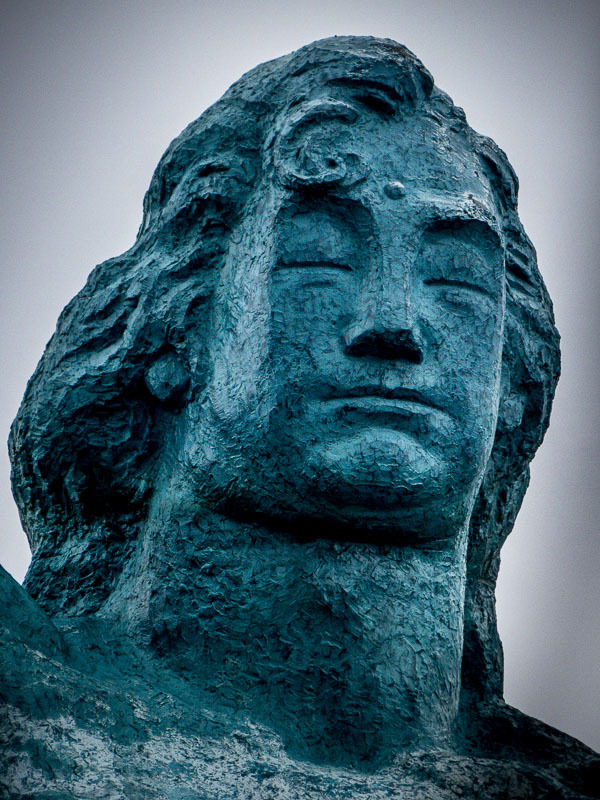 And the closed eyes means praying for the victims of A-bomb. 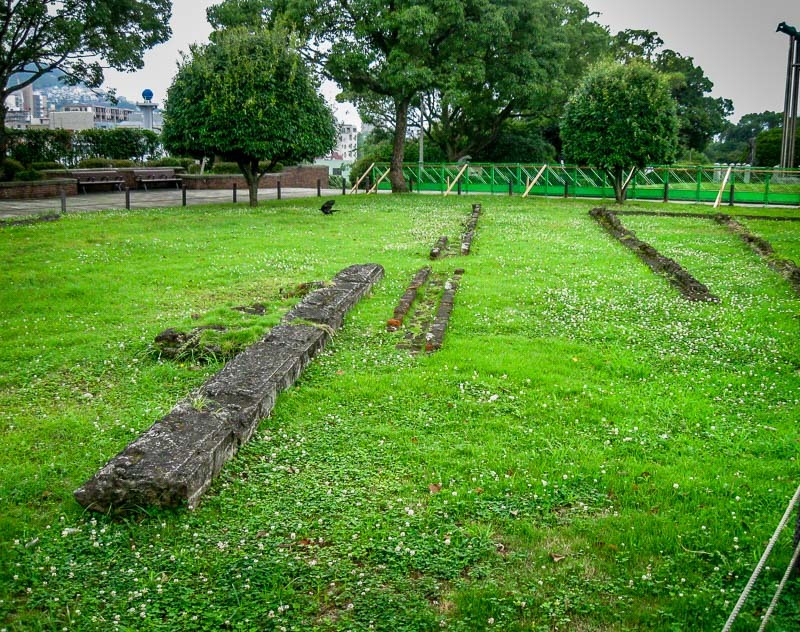 As we continued to walk south, we noticed what appeared to be an old foundation which we later learned was the ruins of the Urakami Branch of Nagasaki Prison that was located at the site. All of the 134 prisoners reportedly remanded there at the time were killed. As one might expect, the peace theme predominates. 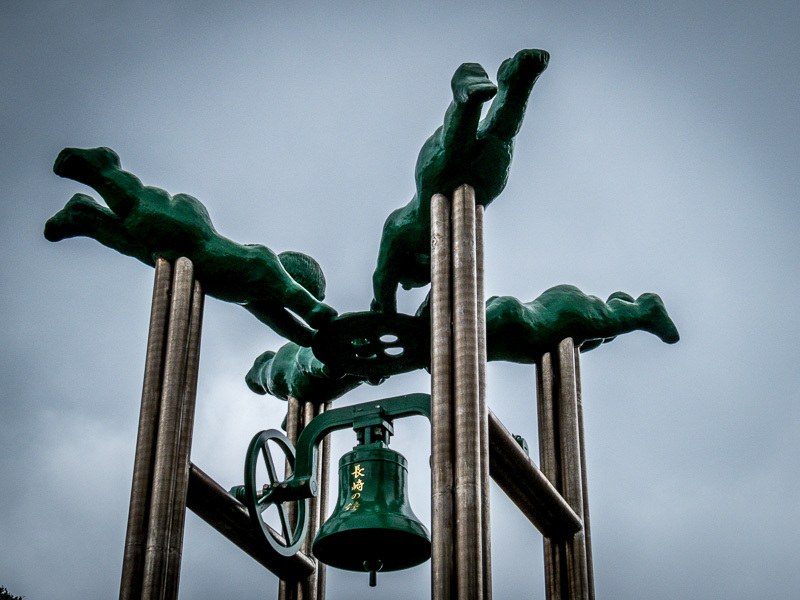 The Peace Bell statue depicts small children holding up a bell similar to the bell of the Urakami Cathedral which was destroyed in the blast. 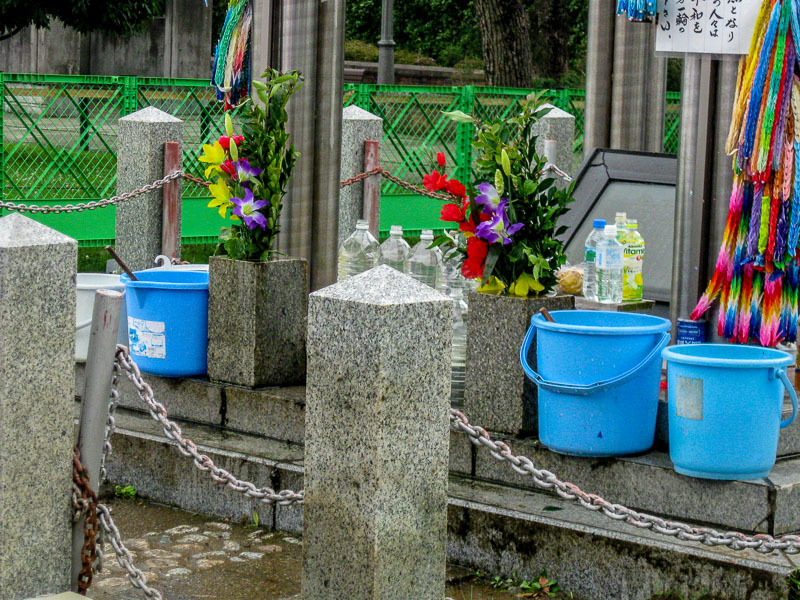 As part of a ritual “cleansing,” people can water flowers and plants that are near the peace bell where Iinosuke Hayazaki sometimes stands. 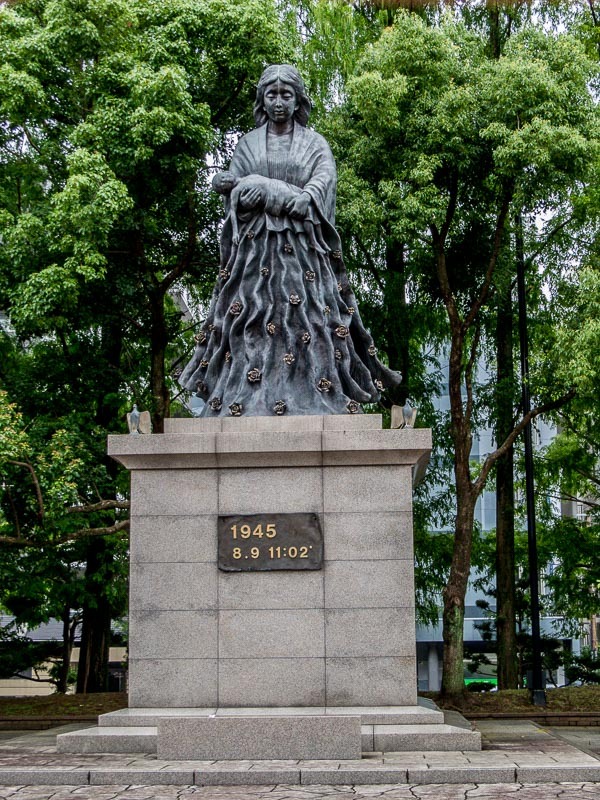 A distance away from this statue, at the south end of the park, is the circular Fountain of Peace. 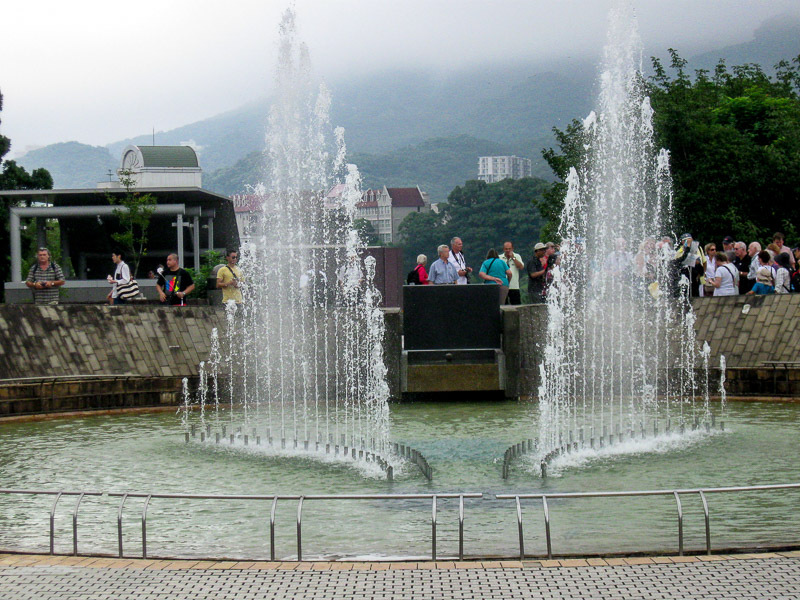 The fountain was constructed for the souls of Atomic bomb victims who died searching for water. 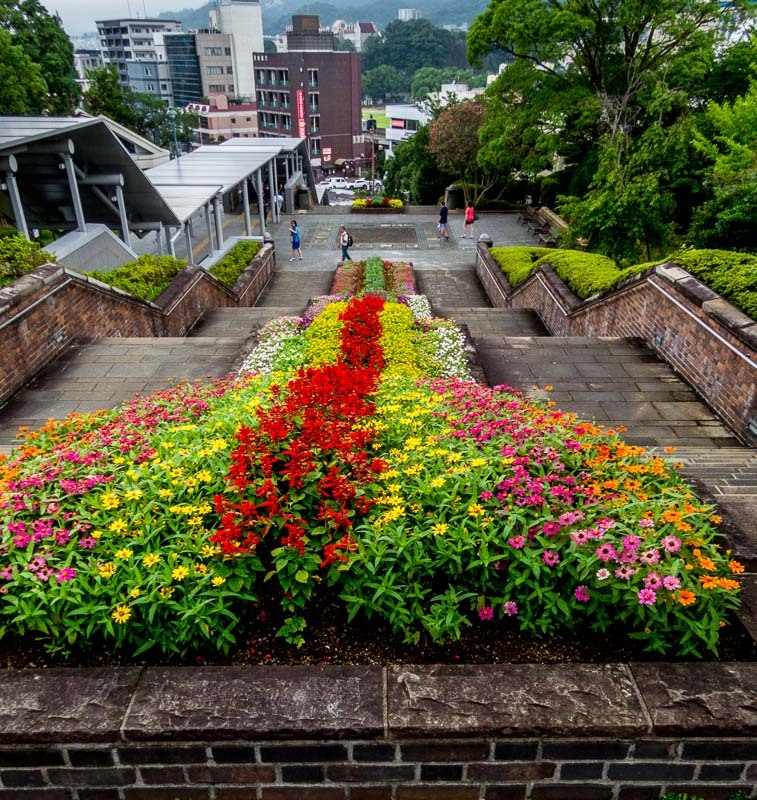 Near the Fountain of Peace is a brick walled staircase which is an entryway and exit for those walking to the park. It was festooned with a beautifully juxtaposed wave of flowers. 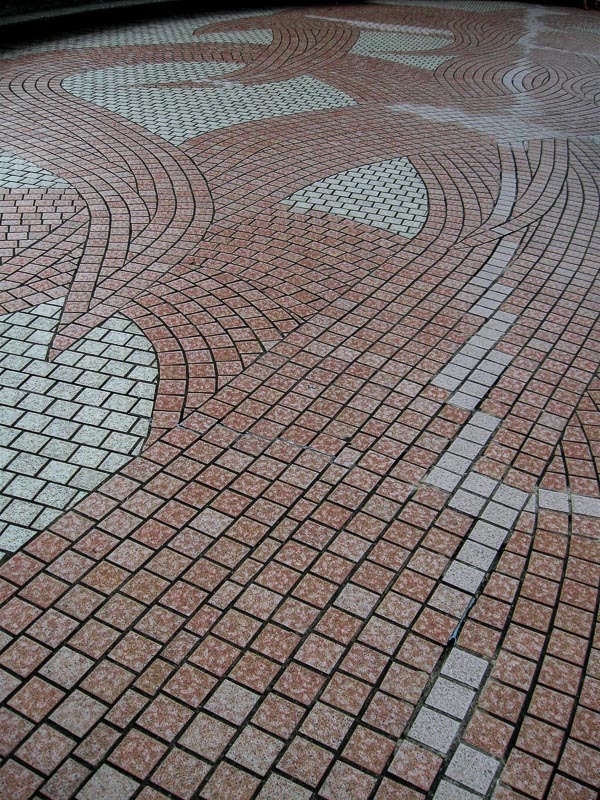 Part of the walkway near the fountain was constructed of red and grey bricks to symbolize flames, heat and explosion. 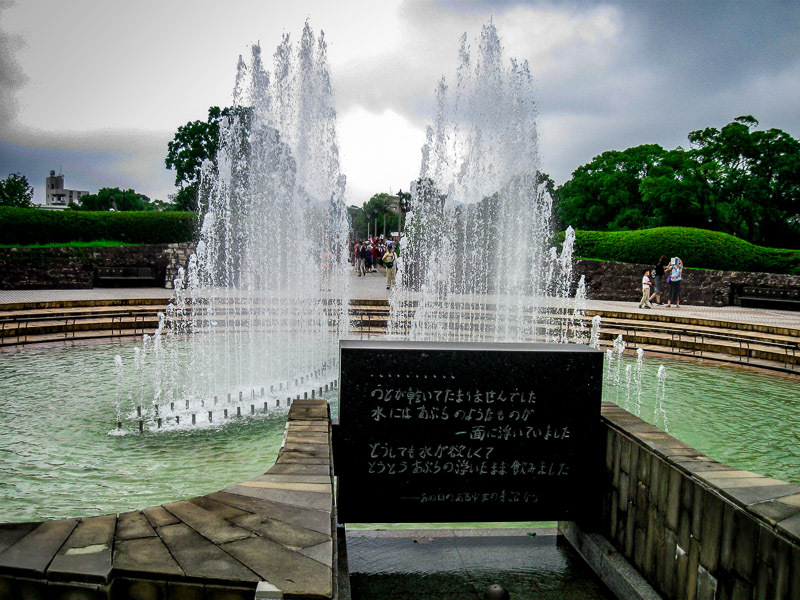 A Peace Symbols Zone was established in the park and other nations, states, etc., from around the world have contributed monuments in support of peace and against nuclear proliferation. 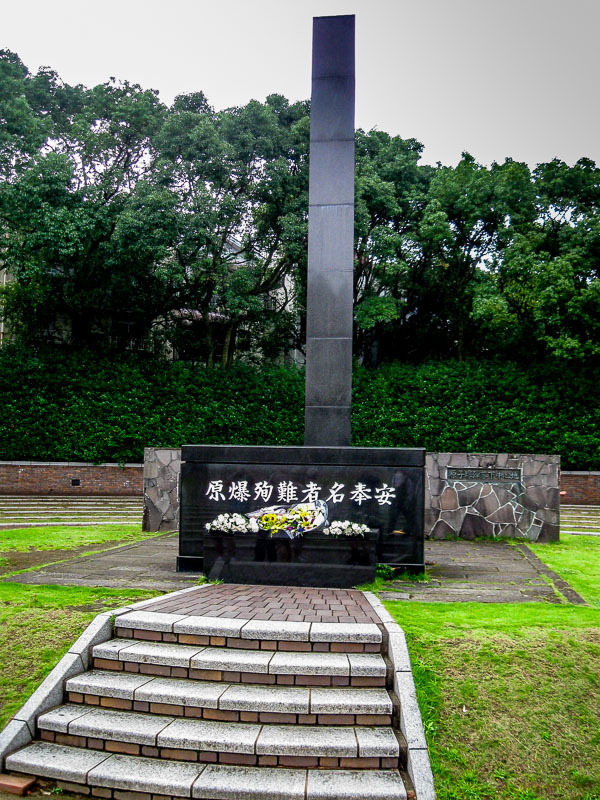 Yet another solemn memorial was a black cenotaph which marked the hypocenter of the explosion. There are signs and statistics detailing the explosion. 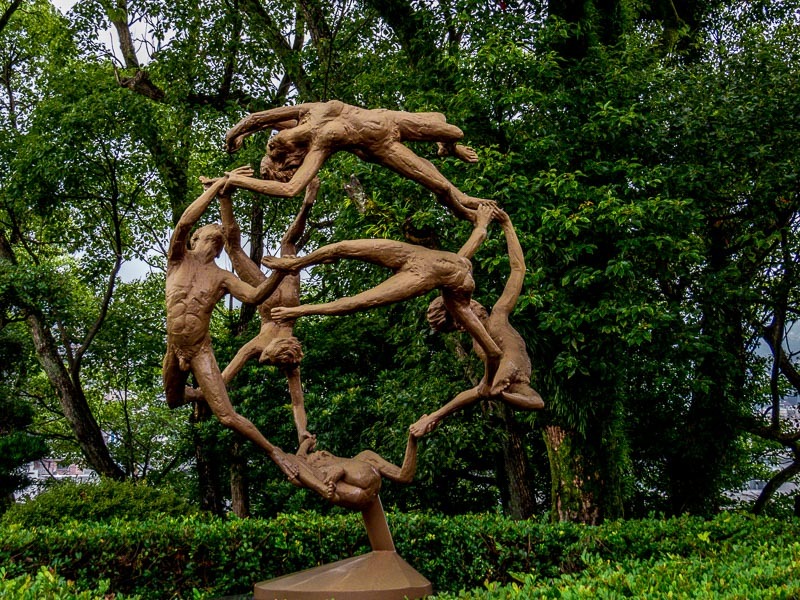 Not wanting the world to forget, and perhaps to serve as a warning, there were other statues portraying the horror of the event. As we made our way to the Atomic Bomb Museum we passed the decorative tower which, by special permission from Greece, temporarily held the Olympic flame. 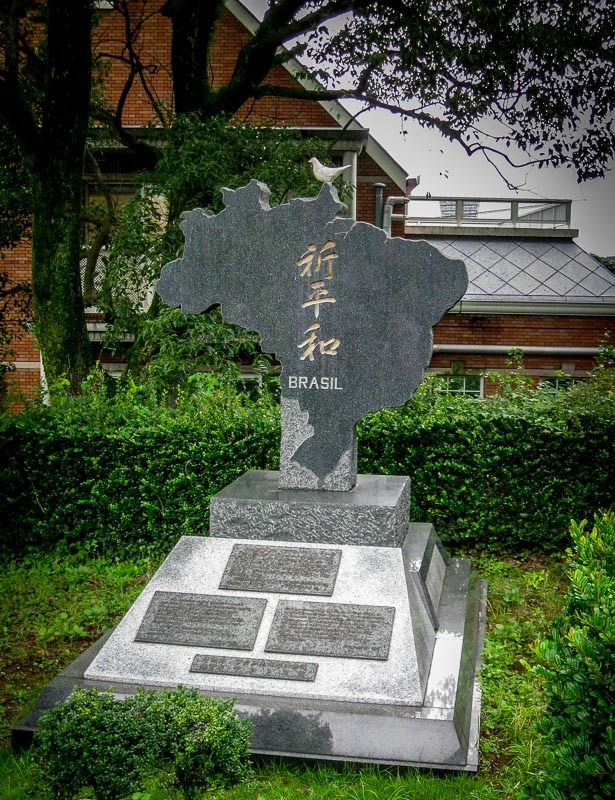 The Atomic Bomb Museum housed much of the history and artifacts related to the Nagasaki bombing. 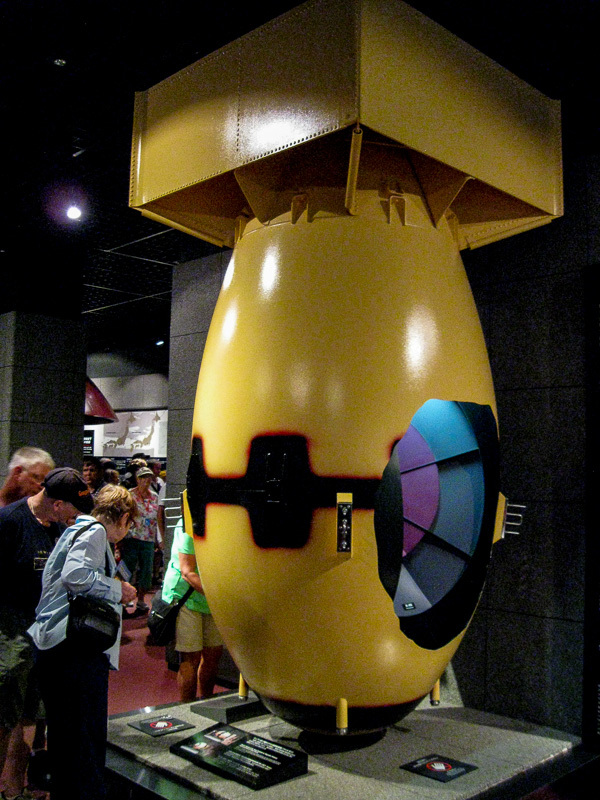 Among the items was a replica of the A-bomb, code named Fat Man, which was dropped over Nagasaki. 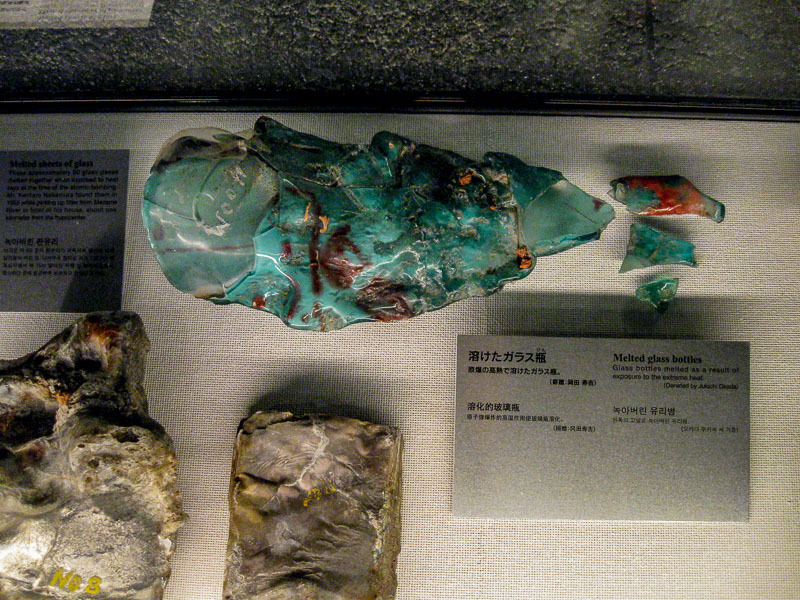 There was a display of glass bottles that melted from the heat of the blast. 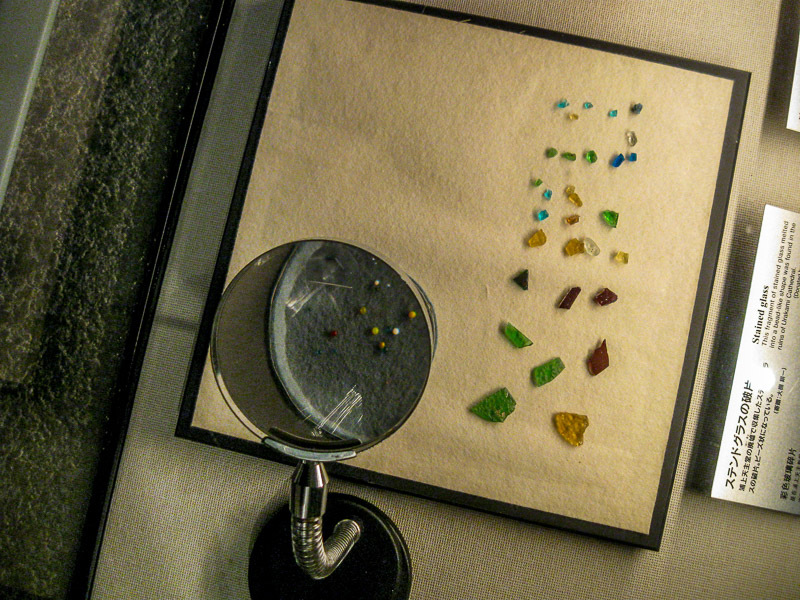 Shards of stained glass shown below were displayed and some were so strongly heated, they formed balls. 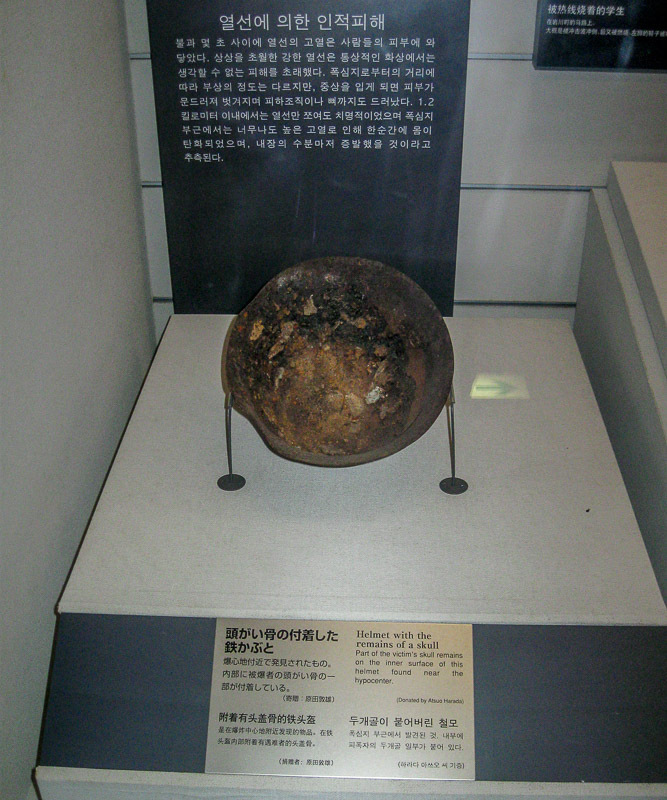 Perhaps most poignant was this metal helmet containing remains of a human skull. 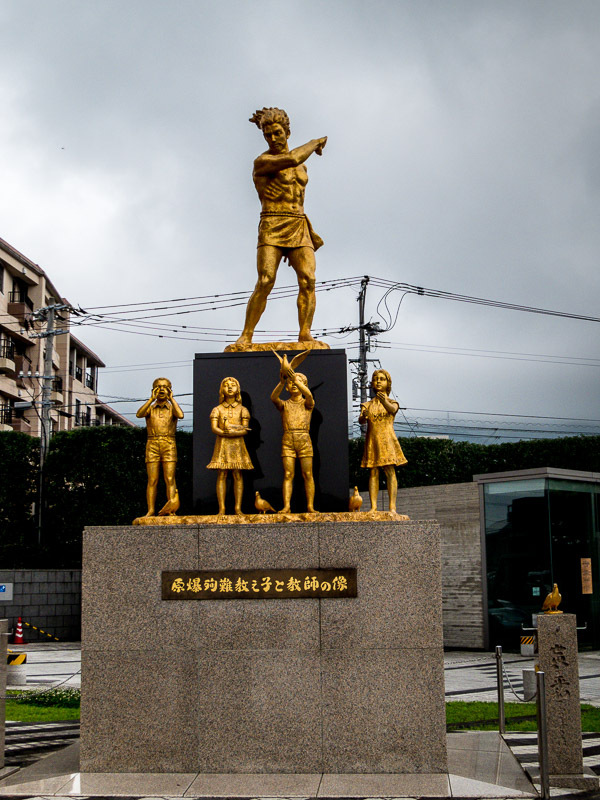 On the way back to our tour bus, we passed the Gold Peace Statue constructed to commemorate the lives of students and teachers lost in the bomb blast. 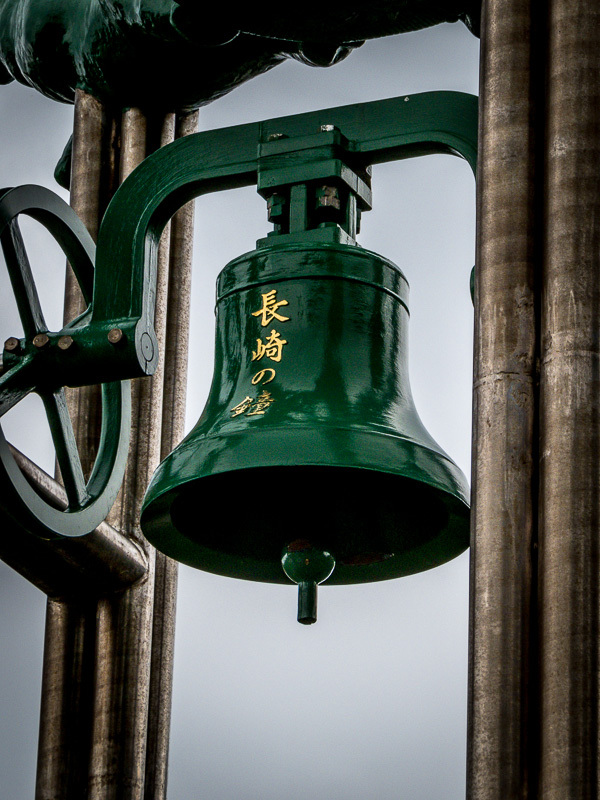 While this was a “heavy” visit, it was an interesting part of history. 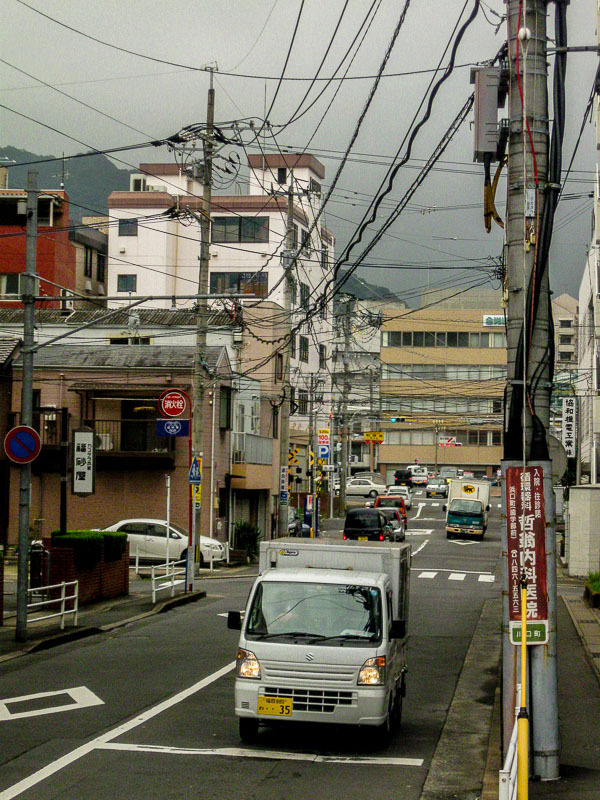 On the way out of town, I couldn’t help but notice all of the criss-crossed wires and cables along the side streets which reminded me of a long ago era. 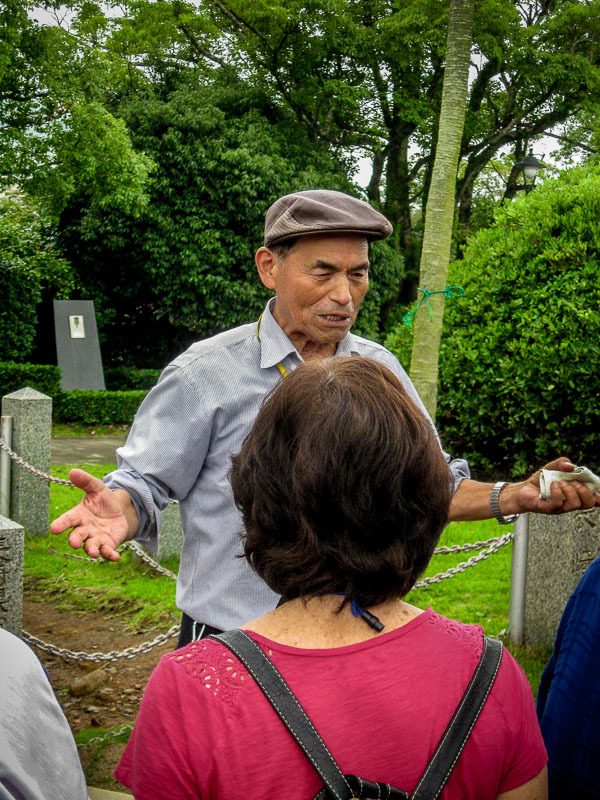 Tokyo (2015) Day 3 – Part 1 – Shinjuku Gyoen Garden and Harajuku St.